In honor of National Physical Therapy Month, our October series is going to focus on the most important part of our practice: our patients. We want to celebrate their successes and have them share the stories of their experiences with physical therapy. In addition, we’re going to demonstrate some of the exercises and manual techniques that helped these patients get back into performing their everyday activities. We’ll start out with a testimonial from a patient from our Brittany Drive location that worked with Brendon Aitken, PT, and Stacie Magaro, PTA. I was diagnosed with throat cancer and had chemotherapy and radiation in early 2017. Unfortunately the cancer was not totally eradicated. I then underwent a radical neck dissection, in which, my spinal accessory nerve, as well as several other nerves and muscles were severed or totally removed. The surgery, while successful, resulted in the loss of use of my Trapezius and several other muscles in my neck, shoulder, chest and back. After consulting with several doctors, nurses and former clients of Baton Rouge Physical Therapy Lake, I began PT with BRPT-Lake. Brendon, Stacie and Rachael were “My Team”, although the other therapists also took an interest in my PT and assisted my Team whenever needed. Everyone’s attitude and approach towards their client’s successful recovery was “It Takes A Village”!! My Team, from day one, was professional, knowledgeable and friendly. I had never needed PT before but had heard numerous horror stories. I was pleasantly surprised to discover that the parade of horribles was more myth than reality. While PT was fairly intense, it was exactly what I needed. In order to get my remaining muscles to develop the flexibility, strength and muscle memory needed to compensate for those that were no longer functional required extensive time, effort and multiple exercises to reestablish strength and flexibility. My Team provided all of those things in a professional, understandable and encouraging way that actually made the PT experience not only very acceptable, but even borderline pleasurable. Every day, I left PT feeling like my flexibility and strength had improved and I was one step closer to regaining both to the level they were prior to my surgery. In fact, I actually got to a point where I looked forward to my PT sessions. I cannot thank my team, the other therapists, the front office and all the staff of Baton Rouge Physical Therapy-LAKE enough for all they did in helping to give me my life back. (L to R): Technician Rachel, PTA Stacie, Mr. Anton Reel, PT Brendon. A few of the manual techniques employed during this patient’s treatment session were shoulder joint mobilizations and scapular mobilizations. Joint mobilizations (shown in this video below) are a great tool to improve shoulder range of motion and decrease tightness in the joint capsule. In Mr. Reel’s case, mobilizations were used to treat movement deficits after chemotherapy and radiation, but they can also be utilized in common disorders such as frozen shoulder and shoulder impingement. 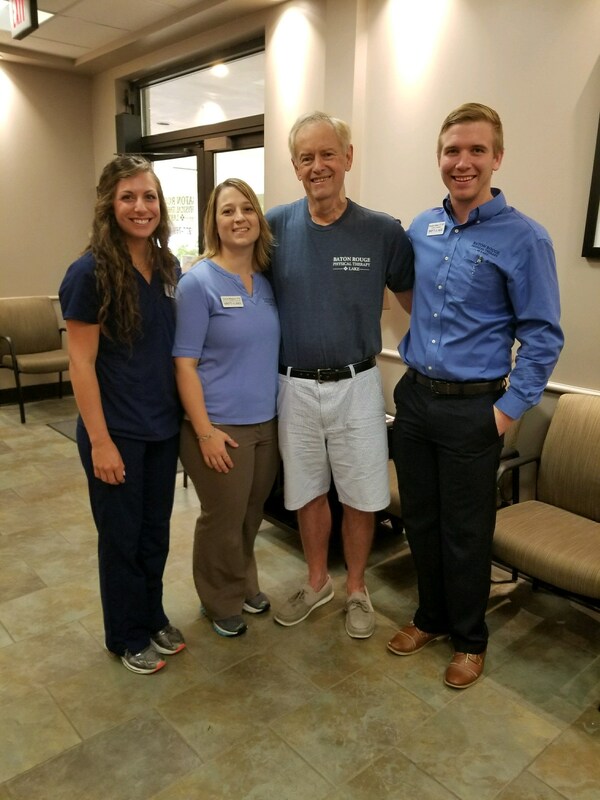 As the patient’s range of motion and strength improved, Mr. Reel’s team worked to help get him back on the golf course. His team incorporated “chops” and “lifts” into his individualized exercise routine to improve functional strength in his upper body and core. Below is a demonstration of the “chop” exercise in the more challenging half kneeling position.